THE LITTLE WAY OF RUTHIE LEMING follows Rod Dreher, a Philadelphia journalist, back to his hometown of St. Francisville, Louisiana (pop. 1,700) in the wake of his younger sister Ruthie's death. When she was diagnosed at age 40 with a virulent form of cancer in 2010, Dreher was moved by the way the community he had left behind rallied around his dying sister, a schoolteacher. He was also struck by the grace and courage with which his sister dealt with the disease that eventually took her life. 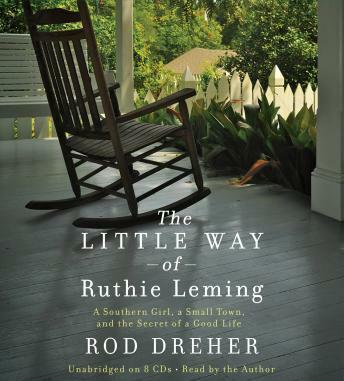 In Louisiana for Ruthie's funeral in the fall of 2011, Dreher began to wonder whether the ordinary life Ruthie led in their country town was in fact a path of hidden grandeur, even spiritual greatness, concealed within the modest life of a mother and teacher. In order to explore this revelation, Dreher and his wife decided to leave Philadelphia, move home to help with family responsibilities and have their three children grow up amidst the rituals that had defined his family for five generations-Mardi Gras, L.S.U. football games, and deer hunting.